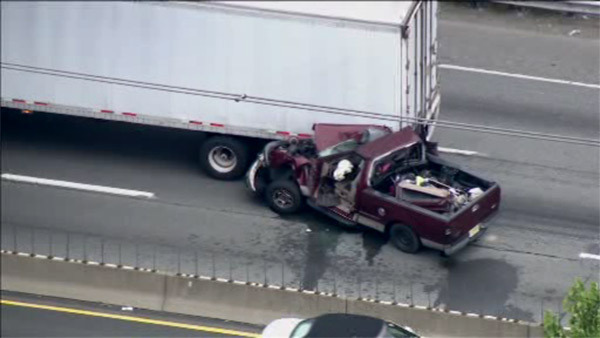 CHESTER, Pa. (WPVI) -- A pickup truck plowed into the rear of a tractor trailer in the northbound lanes of Interstate 95 in Chester, Delaware County. The crash happened around 1:30 p.m. Monday near the Melrose Avenue overpass. The pickup became wedged under the left rear corner of the tractor trailer, trapping the driver inside the vehicle for a time. Rescue crews managed to free the driver of the pickup truck. There is no word on injuries at this time. The accident caused traffic delays in the area.